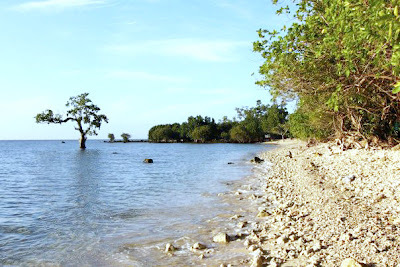 The Marine Turtle Sanctuary is a 2-kilometer stretch of white sand peninsula of Punta Dumalag in Matina Aplaya, Davao City where endangered Hawksbill turtles (Pawikan) have safely found their home and sanctuary. Also known as the Pawikan Sanctuary, the site is part of the 37-hectare Marine Protected Area (MPA) that was established through Council Resolution No. 02504-03 declaring the area as a nesting ground for Hawksbill Turtles. 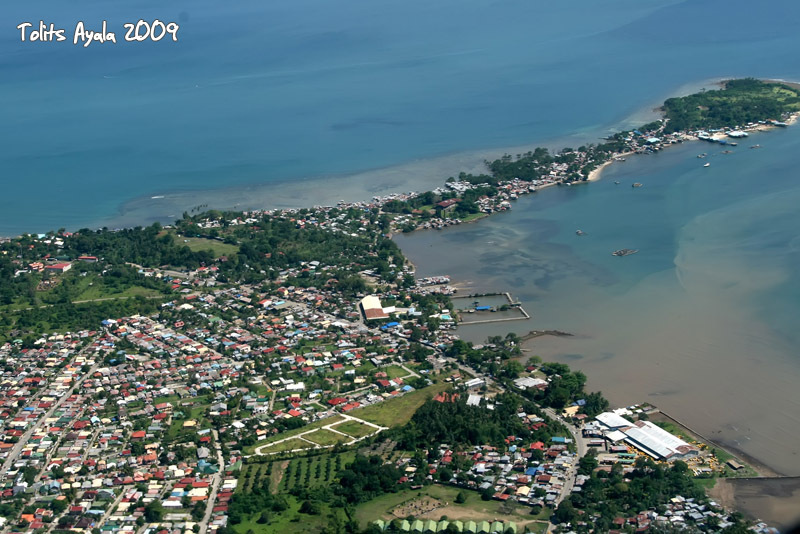 The local government of Davao City created the Marine Turtle Protection and Conservation Task Force through Executive Order 29-2003, purposely for marine turtle conservation and protection. The sanctuary engages in the recovery, tagging, and rescue of illegally captured and detained marine turtles. The sanctuary also manages a hatchery which yields 93% hatching since it started in 2003. The sanctuary is declared a "No-Swimming Zone". While Punta Dumalag peninsula is primarily a marine turtle sanctuary, it is also a declared protected area for mangroves which are abundant in the area. 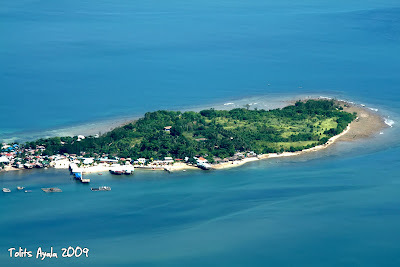 Punta Dumalag used to be an isolated island until a freak storm in 1962 that washed-in sand to its shore and created a natural land bridge that eventually connected it to Matina Aplaya. Developers came in the late 1970's and further dumped more sand and gravel and cemented the land bridge. 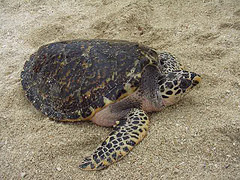 According to old-time residents of Punta Dumalag, the entire peninsula has long been a nesting ground of Hawksbill turtles. The turtles became critically endangered because of massive hunts for its "shell" which were used for guitar picks, combs, bracelets, etc, and sold commercially. Those turtles that remain in the peninsula now are believed to be only a part of the remnants of its population. Marine turtles are known to return to the very place where they were hatched when they reach reproductive maturity of 20 to 50 years. These marine creatures are highly migratory and are capable of remembering the place where they were hatched despite the great distances they have travelled. 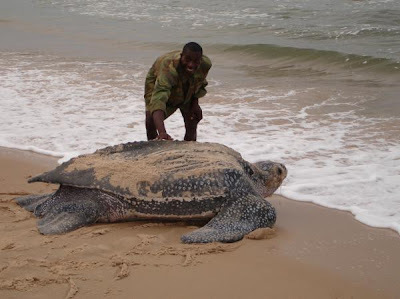 It is for this reason that turtle conservation groups around the world tag these turtles to track their movements. Known in the Philippines as "PAWIKAN"
Scientists consider sea turtles as one of the few living remnants of the dinosaur age that is in constant threat of extinction. Unless sincere efforts are undertaken to preserve these turtles and their marine habitat, it is believed that they might irreversibly disappear into extinction from the face of the Earth. 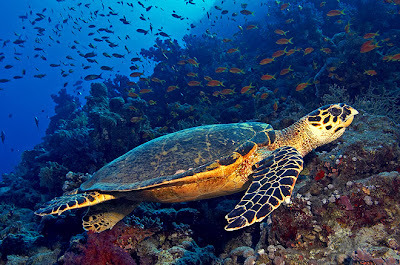 Sea turtles, popularly known in the Philippines as pawikan, belong to the sub-order Cryptodira, and to the families Dermochelyidae and Cheloniidae. 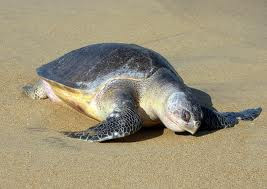 There are more than 220 species of turtles in the world, but only seven are considered marine or thriving in saltwater. 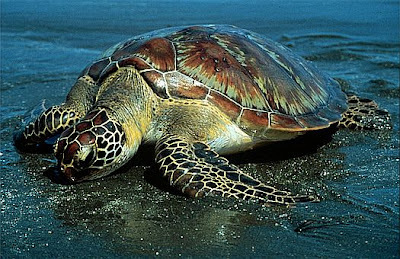 Five of these species are found in the Philippines: the Green (Chelonia Mydas), Hawksbill (Eretmochelys Imbricata), Loggerhead (Caretta), Olive Ridley (Lepidochelys Olivacea), and the Leatherback turtles (Dermochelys Coriacea). Turtles are the only reptiles with shells. It is widely believed by scientists that turtles have been in existence for more than 150 million years now, surviving the age of dinosaurs. Using their shells as protectors, they have adapted well to all types of weather, surviving the most rigid climatic changes. A typical Philippine Sea Turtle weighs between 180 to 210 kilograms and, unlike land turtles, cannot retract its head and limbs under its streamlined shell. It has large upper eyelids that protect its eyes, but has no external ear opening. Awkward on land, it is more active and graceful in the water, gliding underwater as fast as 32 kilometers per hour using its long paddle-like fore and hind flippers. Sea turtles vary in color - olive-green, yellow, greenish-brown, or black. The most common species in the Philippines is the Green Sea Turtle, which is usually found in tropical and sub-tropical seas. 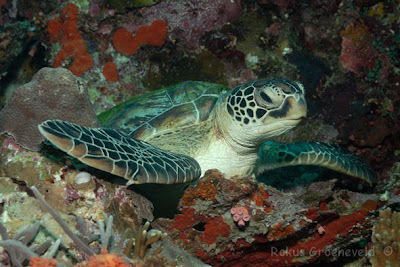 Its most distinct feature is a more blunt and wider head than that of the Hawksbill Turtle. It grows up to 1.5 meters long and weighs up to 185 kilograms. 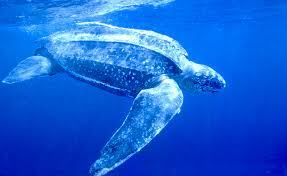 The largest species is the Leatherback Turtle, which grows more than two meters in length. The Hawksbill Turtle, as its name suggests, can be identified with its pointed beak and attractively marked shell of overlapping plates. 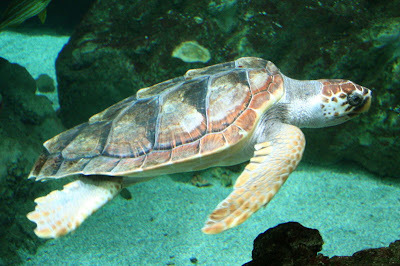 On the other hand, the Loggerhead Turtle is known for its disproportionately bulky head. Of the five Philippine species, only the Olive Ridley Turtle is considered as carnivorous. 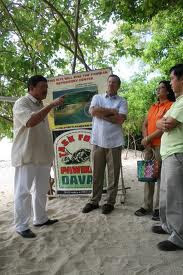 USAID Mission Director Jon Lindborg commended the people of Davao for their intensive efforts in the protection and preservation of marine turtles and their habitat in Davao City. 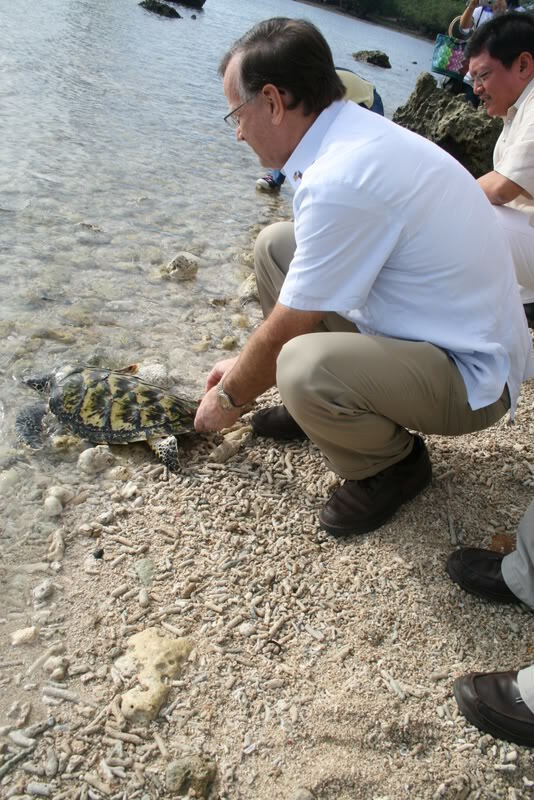 Director Lindborg released a 5-year old Hawksbill Turtle christened "Jon" back to the sea during his visit at the Pawikan Sanctuary in Punta Dumalag, Matina Aplaya as shown in above photograph. Director Jon Lindborg observed that the sanctuary is very close to human settlements and yet it remains well-protected. USAID’s Philippine Environmental Governance 2 (EcoGov2) Project awarded a grant to the Marine Turtle and Dugong Conservation Project through the Save Davao Gulf Foundation, Inc. for the dissemination of information to increase public awareness on the conservation and protection of Hawkbill turtles and their habitats. The grant supports seminar workshops and technical assistance on marine sanctuary management and turtle conservation. 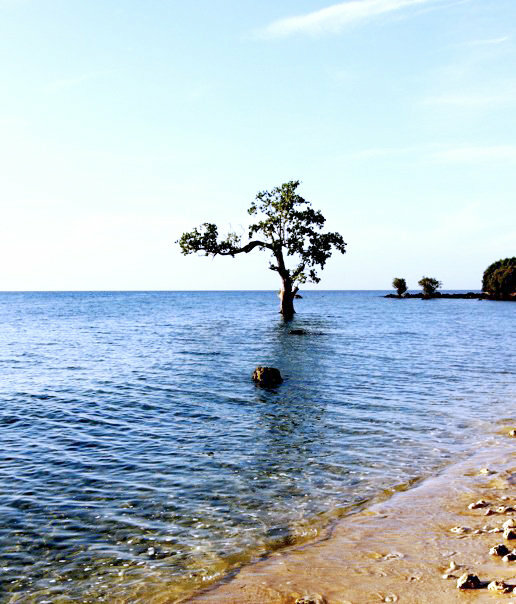 A lone tree at Punta Dumalag that is usually submerged in water during high tide and many had photographed this fixture. 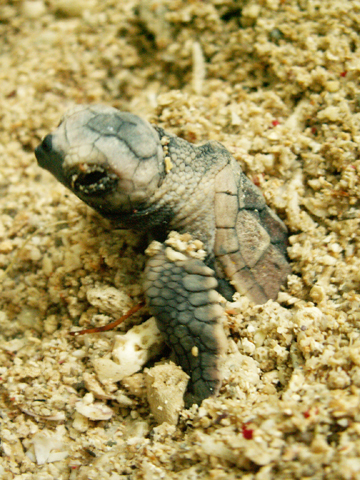 The last century saw the fastest decline in sea turtle population in the world. Sadly, in the Philippines alone, thousands of sea turtles were taken out of the sea to supply the heavy demand for turtle by-products such as wall décor, jewelry pieces, guitars, bags and shoes. Notoriously called the "Pawikan Trade", it was greatly responsible for illegally exporting about 32,921 kilos of Hawksbill bekko out of the country to the lucrative Japanese market, which is considered as the world’s largest importer of sea turtles. Even more disturbing is, aside from local fishermen, foreign poachers are also exploiting the remaining already endangered sea turtles. On March 25, 1995, four Chinese vessels were caught carrying live and dead sea turtles in Philippine waters. The Philippine government has launched the Pawikan Conservation Project (PCP), to protect all Philippine Sea Turtles. 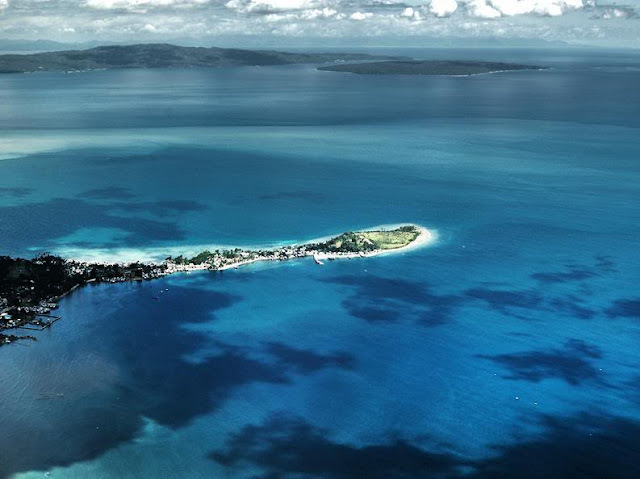 In addition, nine islands between Malaysia and the Philippines were renamed as the Turtle Islands, which serve as the largest green turtle sanctuary in Southeast Asia. Sadly, however, Pawikan hunting remains unabated elsewhere. Such efforts will be in vain unless people in the area cooperate. To help protect the Philippine Sea Turtles, one may coordinate with the Pawikan Conservation Project at Telephone Numbers, 63-2-9246031 to 35. Hello! I would like to know how to get to this turtle sanctuary via public commute from the city center of Davao. Thanks! The easiest way to reach the site is via southbound Jeepneys with signboards, "Bangkal," "Ulas," or "Toril" which are readily available anywhere in downtown and will traverse Mac Arthur Highway and drop you off at Matina Crossing where you can take another jeepney or tricycle ride to Punta Dumalag where the turtle sanctuary is located. Good luck. 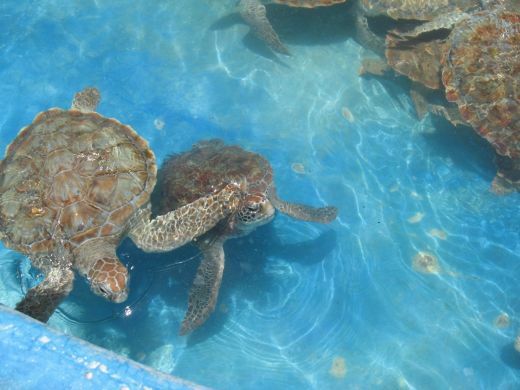 Would you know if (and why) the adult sea turtles are still being kept at the sanctuary? are they being rehabilitated? for how long? Thanks! You might want to update this entry. 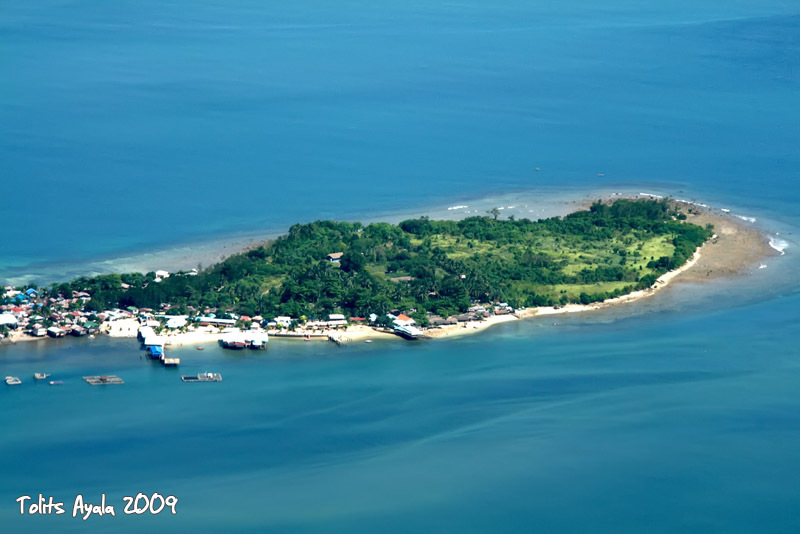 The pawikan sanctuary in Punta Dumalag is no longer there. I went there yesterday and the property now has a "do not enter, private property" sign. The neighbors said that the turtles have been gone since last year, probably transferred somewhere. I am not sure though if wild adult females still return to the property's beach to lay eggs, because the neighbors also said they haven't discovered any nests since the turtles being kept in the sanctuary were moved. Thanks Sirithulmaion for the update. 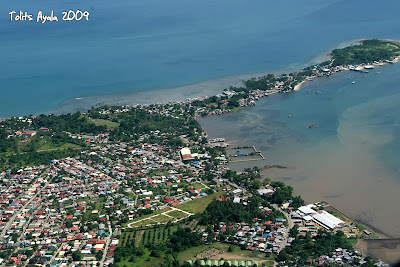 Quite frankly, I am not aware that the sanctuary is no longer at Punta Dumalag and had perhaps been moved elsewhere. Let me ask around and see what I can come up with and let you and the readers know of any update. how do we go to the turtle sanctuary from davao city? also do you know if it will be open on december 26? thanks. is it ok to have a fishing there?